How can we reach more learners, more effectively, and with greater impact? Education changes lives and societies, but can we sustain the current model? New models and new technologies allow us to rethink many of the premises of education—location and time, credits and credentials, knowledge creation and sharing. 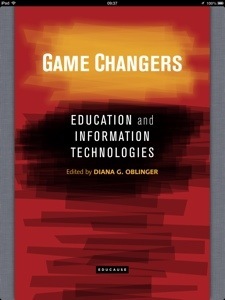 Game Changers: Education and Information Technologies is a collection of chapters and case studies contributed by college and university presidents, provosts, faculty, and other stakeholders. Institutions are finding new ways of achieving higher education’s mission without being crippled by constraints or overpowered by greater expectations. Find out who is changing the game and what we can learn from their different approaches in Game Changers. Download the entire book or individual chapters and case studies below. Goed leesvoer voor op de terugvlucht vanmiddag. Download Windows 7 niet onder Firefox!